With its sandy beaches and undisturbed stretches of marshlands, Glynn County can seem like a paradise on Georgia’s southern coast. Popularly known as the Golden Isles, it has long attracted those seeking to get away from it all. In fact, decades ago it was a retreat for the wealthy like the Rockefellers and Vanderbilts. They built the famous – and very private – Jekyll Island Club on one of those Golden Isles, and it remains today – although its doors are now open to a less elite group. While tourism is still its biggest business, Glynn County has evolved into a more complex economy. Big corporations like Gulfstream have a presence here. The Port of Brunswick has become one of the busiest in the nation and the leader in both auto imports and farm product exports. The county is also working to get back on its feet after a rough few years during the economic downturn. 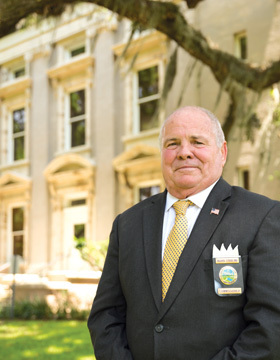 “We’re still in the recovery mode when you compare to the pre-recession numbers, but overall the economic indicators here in the county are very positive,” says Glynn County Manager Alan Ours. He notes that last year’s sales tax numbers were increasing month over month by a healthy 11 percent. This year, that pace has slacked off to about a 5 percent increase per month but is still growing. Local leaders are optimistic about the future. Some of the most promising signs can be found in the steady stream of visitors making their way to the county. More than 2.6 million tourists visited the county last year, and they produced $1 billion in economic impact through both direct and indirect spending. Over the last five years, tourism has increased a whopping 51 percent, according to Strickland. Most of those visitors were headed for the Georgia Golden Isles that have made the region famous. One of the most popular destinations has been the resorts on Sea Island, which attracted more than 250,000 guests and members during 2015. To meet the demand, Sea Island Co. has invested $120 million over the last five years into expansions and upgrades at its facilities. This past April, the company completed its $40-million expansion of The Cloister, adding 63 additional guest rooms along with a 5,000-square-foot ballroom. Along with expanding facilities, the company opened the new 85-room Inn at Sea Island on St. Simons. It’s a more affordable alternative to the ritzy The Lodge – ranked the best hotel in the country by U.S. News & World Report – and The Cloister on Sea Island proper. Times have certainly changed on nearby Jekyll Island. During the 19th century, rich industrialists transformed the 7.5-mile-long barrier island into their private wintertime retreat. Their marsh-side vacation homes – whimsically called “cottages” – along with the famed Jekyll Island Club, are now National Historic Landmarks. Today’s Jekyll Island is open and ready for business after a massive (and continuing) transformation of its convention center, hotels and retail shops. Along with the modern convention center that opened in 2012, there’s a new 200-room Westin hotel and a 157-room Holiday Inn Resort. Plans call for expanding accommodations with 1,000 new rooms slated between 2015 and 2020. Meanwhile, the 123-unit oceanfront Cottages at Jekyll Island, the first residential development on the island in more than 40 years, is being built on the site of the old Jekyll Oceanfront Clarion Resort. Old timers who haven’t visited the island in the last few years will no longer recognize the place. All the old and declining hotels are gone. The emphasis is on the new and modern. Visitors and conventioneers have a much wider selection of retail at the new Beach Village, with more than 20 shops open already and remaining spaces filling up fast, according to Hooks. The construction industry suffered some of the biggest losses during the recession, but it, too, is now starting to rebound. The number of new homes under construction is on the rise. In 2015, building permits were issued for 375 single-family homes with a total construction cost of $128 million. “The wealthy are also continuing to build some very large homes in Sea Island and some gated communities on St. Simons Island, which is certainly very positive,” notes Ours. One of Glynn County’s most consistent assets has been the Port of Brunswick, which over the past few decades has grown into one of the busiest ports in the nation. The port is the fastest-growing major ro/ro terminal in the U.S., with a 10-year annual cumulative growth rate of 12.8 percent, compared to the national rate of just 4.5 percent, according to the GPA. The result is an operation that supports more than 4,300 jobs in Glynn County and more than 9,000 jobs in the surrounding area. Every dollar spent by the port generates an additional 66 cents for the local economy. To meet the growing demand, the port has invested $46 million over the last decade. The next 10-year plan calls for approximately $152 million in spending on upgrades – almost a tripling of investment, according to Lynch. Glynn has a modest but growing industrial base. One of the county’s biggest industries is centered at the Brunswick Golden Isles Airport. Here, jet maker Gulfstream just finished an expansion of its service center. The company developed a $25-million, 110,000-square-foot maintenance repair and overhaul facility near its two existing hangars. The expansion is creating more than 100 additional jobs, a 50 percent increase in the size of its current workforce. The county has been busy expanding the airport’s ramp space to accommodate both Gulfstream and Stambaugh Aviation, which builds and maintains refueling planes under contract from another company, Omega Aerial Refueling Services Inc. – the only company in the world conducting commercial fee-for-service in-flight refueling services. The airport itself, which had once been used to launch blimps to search for German U-boats during World War II, can accommodate some of the largest jets that the companies service. “Our customers are very fond of that site, and it has developed a very loyal following among a segment of our customers who like going to Brunswick because of the personal relationships they have with our employees and the local community,” says Neely. Once an aircraft comes in for scheduled maintenance or repair, it typically remains at the center for several weeks. During that time, owners’ maintenance chiefs stay with the plane directing the operations. More jobs and people have also helped fuel an uptick in retail. Now under construction, the 400,000-square-foot Canal Crossing shopping center at Exit 38 off I-95 will have restaurants and retailers like Sam’s Club, Home Goods, Hobby Lobby and Academy Sports + Outdoors. To make the development possible, the county has invested $4.5 million in various infrastructure improvements to facilitate traffic flow for the area. The quest for more shopping opportunities is designed to persuade residents from surrounding counties to do their spending in Glynn. If you wanted to buy most consumer goods in years past, it meant driving north to Savannah or south to Jacksonville. Now more of those dollars and the tax revenues that go with them will be coming into the county, predicts Strickland. “We are hoping that people will be more inclined to shop in Glynn County than go outside the county,” he says. Despite this recovery and a declining unemployment rate, Glynn is also trying to figure out how to create an economy that works for everyone. In some respects, Glynn’s economic recovery is a mirror of the nation at large. Since the end of the Great Recession, no area of Georgia has had a harder time recovering than Brunswick. Real GDP in the Brunswick area has fallen by 8.5 percent, from $3.4 million in 2009 to $3.1 million in 2014. Beginning in 2006, real GDP dropped by 12.9 percent, from $3.6 million in 2009 to 2014’s $3.1 million, according to a study by the Reg Murphy Center for Economic and Policy Studies at the College of Coastal Georgia. This pain has not been evenly distributed because there are two Glynn Counties. One is the affluent islands, and the other is a poorer, still struggling mainland, according to Dr. Don Mathews, economist and director of the Murphy Center. One of the county’s biggest challenges has been expanding its economic base beyond the fast-growing hospitality and retail industries. In addition, the area has lacked a large group of trained workers that tend to attract companies. To become more attractive to companies that can provide good-paying jobs means the workforce has to be better trained. Developing that workforce has become a top goal for the county. To identify what skills workers require to meet industry needs, the Southeast Georgia Joint Development Authority, which includes Glynn County, recently embarked on an extensive analysis of the area’s workforce. One organization that will be able to use the document is Coastal Pines Technical College, which has a campus in Brunswick. To help meet the needs of local business, the college is building a new 53,000-square-foot training facility. In addition to the 500 students enrolled in credit programs, the college offers continuing education and customized training for local business and industry. Throughout this scenic region, there is a renewed sense of hope that the bad days are now done and greater prosperity lies ahead. Most of all, there is a feeling that the future of Glynn County and the Golden Isles lies in the hands of those who live and work within its borders. A Hidden Gem: Travelers on I-95 are usually on their way to the beach and islands – Sea, Simon or Jekyll. In their haste, they often bypass one of the lesser-known treasures of this region – the city of Brunswick. Its downtown streets are filled with historic buildings, quaint shops and friendly people and a growing number of reasons for beachgoers to stop over. “What we’re trying to do now is to say to people, ‘Stay awhile and find out some of the great things we have here,’” says Mayor Cornell Harvey, a passionate cheerleader for this historic and scenic coastal Georgia city. Those reasons include the Brunswick Actors’ Theatre, which hosts six stage productions a year in its 113-seat theater downtown on Saturday nights and Sunday afternoons. There’s also the c. 1899 former opera house, now the Historic Ritz Theatre, that showcases musical performances, movies and more. The theater was restored in 2010 by the Golden Isles Arts and Humanities Association through a Fox Theatre Institute grant, and its original neon sign now spreads its glow aalong the streets of downtown once again. There’s also First Fridays, where on the first Friday evening of every month downtown businesses throw open their doors and locals and visitors enjoy live music, beer and wine tastings, and more. If that’s not enough, festivals abound year round, including the annual Georgia Elvis Festival held each March that draws Elvis tribute artists from all over the world. To give visitors more of a reason to stay, a $14-million, 125-room hotel is proposed for the site of the long gone and much lamented Oglethorpe Hotel. The city is considering building a 10,000-square-foot conference center adjacent to the hotel. The pair will be a strong attractor for small regional meetings and special events. The old Oglethorpe, designed by noted architect J.A. Wood and constructed in 1888, was once one of the region’s grandest hotels. Constructed of brick, it had three floors with gothic towers on each corner of the building. It continued to operate until 1958, when it closed and was torn down soon after.